Hazardous Level: Non hazard to humans. 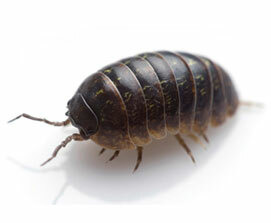 There are two common species of land adopted crustaceans - the sowbug and Pillbug. Also known as the potato bug. The sowbug is dark brown or grey and measures 16mm. The pillbug is a shiny grey and measures 10mm. The main difference between a Sowbug and Pillbug is the Pillbug's ability to roll into a ball when disturbed. Are Sowbugs hazardous to humans? No. They are not a health hazard but a nuisance none the less. The female sowbug carries approximately 40 eggs on her underside until they hatch (approx. 44 days). She averages two broods per year. An infestation of Sowbugs can number in the thousands. How do I keep Sowbugs out of my basement? Sowbugs depend on moisture (as they have gills), so we recommend using a dehumidifier to aid in keeping your basement dry. Also, simply keeping your basement tidy will go a long way. This means pickup up loose pieces of wood, scraps of carpet and stacks of magazines off the floor. Drying out your basement can take a full year as wood and housing materials take a while to rid themselves of moisture. Your compost pile will be full of these bugs, so try to keep your compost heap far away from your home to limit their infestation. You also want to keep plant life and vegetation (other than grass) at least a foot away from your home. Plant life can cause more moisture problems. What can I do if I have an infestation of Sowbugs?